My husband and I are seriously considering moving to STT but I can't find a whole lot about the public school system there. Our daughter is only 4 months old right now but we know it's coming soon enough. Any info would help a lot! I have looked at some private schooling but since we plan on having another baby I don't think we could afford it. Thanks in advance! Many people will advise that you will be putting your child (future children) at a great disadvantage by sending them to there local public schools in the USVI's. If you value the worth of education in this competitive world send your children to private school - the tuition, while costly, is a small price to pay over a lifetime. Also, if you can't afford the tutition for a private school, you may not be able to afford to live there. The cost of living is quite high compared to the states. There are many who home school in the USVI and home schooling is quite main stream now. Give it a thought. Sibilly School is a quite nice Public School here on North side. I am curious about public school enrollment there, do you go to which school according to where you live on an island, or can you pick which public school your kid goes to? That I do not know. May have to contact Dept. of Education. I think that schooling is a pretty personal choice, but I will tell you about my experience thus far and how my thoughts have changed. I'm on St. John, so my situation is different, but I'll give it a go! I have a 13 year old son, who was born and raised here and we chose to put him in private school from pre kindergarden to fifth grade. He is a super smart kid, but the school was a horrible fit for him. I was dead set against having him in public school at the time. The public schools here had that bad of a reputation that I didn't even consider it. But I regret having my son in the private school for as long as I did. I also have a 3 year old son. And I plan on having him in the public schools. Some of the things that made me change my mind… first of all, I really think it's about parental involvement. The more involved you are as a parent, the greater the chance your child has at succeeding at any school. 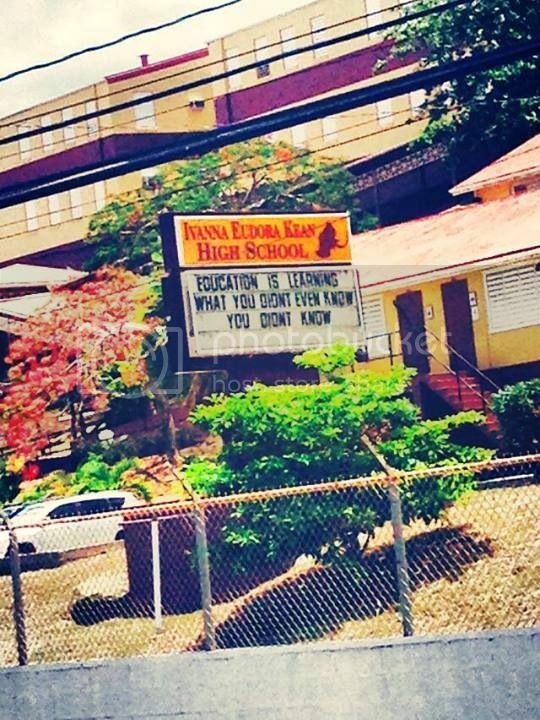 The private school on St. John I sent my 13 year old to just wasn't worth the $10k+ a year. It was not that much better (in any way) than the public schools. I also hated how 'disconnected' the private school was from this culture, the culture that I love for the most part. I have a good friend here that has always had his daughter in the public school system and she is thriving in so many ways. This friend had a big part in changing my perception of the public schools. ***please note that corporal punishment is legal in the USVI, I do not want to turn this into a discussion about corporal punishment, I just want you to be informed. I really think you are just going to have to come here and check things out for yourself. You have some time since your little one is still very little. Also, you do have to have your child in the school in your district unless you are granted permission by the school board to have them in another district. I think they call it a hardship exception (especially granted to parents who work long hours in a different area of the island). Many transplants that come to the island chose to have their children in private schools or move back to the states when their children are of school age. Right or wrong, it is what it is. bored student forced to study material that they feel is not relevant to their lives. many state-side schools. I guess I'll find out if I live in St Croix. I have also heard good things about the old Peace Corps. School in Mandahl that they changed the name of which I cannot recall. Browski (??) This is a public school. You just have to do the legwork and check them out to see what you are comfortable with doing. They weren't accredited for quite a while. i thought the graduation rate was lower? Does this answer your question about public schools? Since the OP's daughter is only 4 months old, presently, there is plenty of time for her to explore the various options a public school has to offer and decide if that is the right choice for her child. Sibilly and the Old Peace Corps. School (Browski?) which was rebuilt and had it's name changed are both good options. They serve only grade school aged kids (K-8) not high-school.